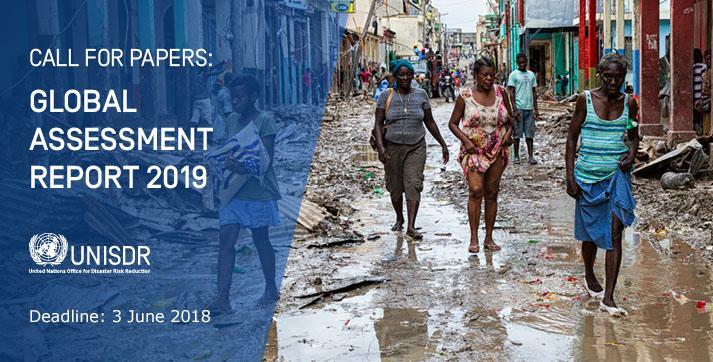 United Nations Office for Disaster Risk Reduction (UNISDR) have launched the official Call for Papers to contribute to the UN Global Assessment Report on Disaster Risk Reduction 2019 (GAR19). The UN Global Assessment Report on Disaster Risk Reduction (GAR) is the flagship report of the United Nations on worldwide efforts to reduce disaster risk, and is published biennially by the UN Office for Disaster Risk Reduction (UNISDR). The GAR is a vehicle to show-case Member States’ and non-State stakeholders’ progress in implementing the Sendai Framework for Disaster Risk Reduction as well as the disaster-related targets of the SDGs, to assess global risk trends, and to present innovative research and knowledge to enhance understanding of disaster risk in all its dimensions. All with the objective to support risk reduction efforts globally. Developed through an extensive set of partnerships with international organizations, governments, businesses, academic and research institutions, the GAR is both an ongoing process of evidence generation and policy engagement, as well as biennial opportunity to showcase and report. In so doing, it promotes access to risk information for decision-making, and identifies feasible practices that can be employed at the local, national, regional and international levels. The report contributes to the biennial Regional and Global Platforms for Disaster Risk Reduction, and the High Level Political Forum on Sustainable Development. Progress reporting that is provided by countries through the Sendai Framework Monitor System, is captured in the GAR as well as the annual Report on the SDGs. Please find structure and themes of GAR19 in the Call for Papers document. Abstracts will have to be submitted by email to UNISDR by 3 June 2018 following the below requirements and using the submission template. Deadline for submission of abstracts for GAR19 papers is the 03 June 2018. Abstracts must be 300 words or less. Selection will be conducted by UNISDR, whereupon successful authors will be notified by 15 June, 2018 to develop full GAR19 papers for submission by 15 August, 2018. All papers having successfully passed peer-review will be made available online as an annex to GAR19 by May 2019.